The reason that we know Epona's name is because of dedicatory inscriptions (mostly in Latin, a few in Greek) and through passing references in the Latin literature. Although the name Epona is clearly Gaulish, there are no inscriptions to Epona written in Gaulish. The custom of setting up dedications for others to read was introduced to Gaul by the Romans, so the inscriptions use Epona as a foreign name. Many of the Epona inscriptions are regular Roman altars with a carved focus on top (for libations or other offerings) and an inscription on the front face. The sides may be carved or, in many cases, are plain. Here a representative selection of Epona inscriptions is presented. 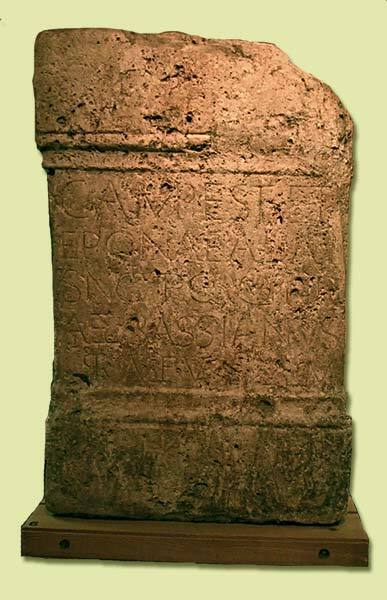 The following inscription from Ulcisia Castra (modern town of Szentendre, Pest County, Hungary) [AE 1973 #438, Euskirchen #282] is typical. 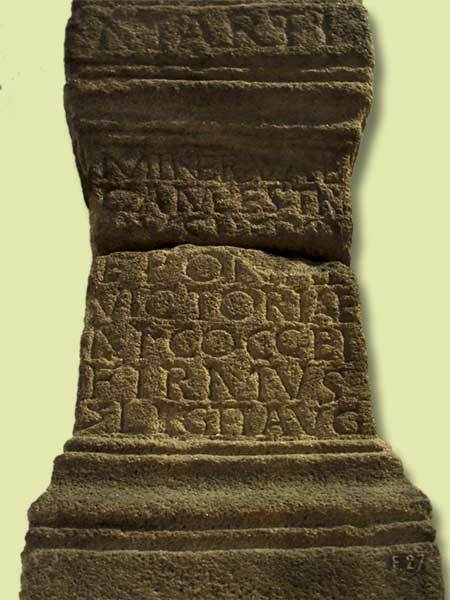 Dated to 1 June on the inscription itself, and to the year 241 by mention of the consuls, this altar is dedicated 'to the spirit of the squadron' (Genio Turmae) and to Epona, here given the additional epithet of 'Queen'. The military unit was a cohort of mounted archers. This altar from Pförring (Bayern, Germany) [CIL III #5910 and 11909] is dedicated by an ala (auxiliary cavalry wing). The inscription says 'To the gods of the parade ground and to Epona, the first corps of equites singulares, pious, loyal, formed of Roman citizens and led by the prefect Aelius Bassianus, in fulfillment of a vow'. The altar is dedicated to Mars, Minerva, the Goddesses of the Parade Ground, Hercules, Epona, and Victory by Marcus Cocceius Firmus, a centurion of the 2nd Legion and most likely a member of the emperor Marcus Aurelius' bodyguard [Birley]. 'To the goddess Epona, Satigenus son of Solemnis willingly fulfilled his vow'. It is likely that the lettering was applied after purchase, rather than by the same metalworker who created the bronze plaque. This inscription from Aptaat (Tolbuhin region, Bulgaria) is one of the few inscriptions in Greek [Reinach 1902 p.237; Magnen & Thévenot #33 (inscription) #219 (depiction)]. It does not name Epona explicitly, but is carved on an imperial type stone bas-relief of Epona seated between two horses which face inwards, offering them food from her lap. Passers by were thus expected to recognise the goddess by her attributes alone, the name being considered superfluous. The inscription reads 'Aelius Paulinus has given this image of the auspicious goddess'. It is from Aptaat (Tolbuhin region, Bulgaria) and is dated to the beginning of the second century ce at the time when cohort II Gallorum was staying in Mosesia (100-122ce). From the name of this unit, it was originally raised in the Gauls, but units recruited locally when they were stationed in one place for any length of time. The native language of this dedicant was clearly Greek, spoken in preference to Latin in the eastern part of the Empire, but a dedication is made to Epona as one of the deities of the unit. "Consecrated to the August Goddess Epona, Marcellus, son of Maturus, in this place, freely at his own expense, gladly and deservedly fulfilled his vow". Based on the letterforms, to the epigrapher Hirschfeld dated this inscription to the end of the first century [Boucher; Thévenot ]. A rustic calendar inscribed on stone at Guidizzolo (Mantova, Lombardia, Italy) mentions the feast of Epona. [Boucher 1999, ILS 4917, RA 1892] It is now in the church of St. Martini. Guidizzolo is south-west of Verona and north-west of Mantua, and thus falls in the area of northern Italy which was formerly the province of Gallia Cisalpina. The fifteenth day before the kalend (first) of January is 18 December. Boucher, Stéphanie (1984). L'inscription d'Entrains CIL XIII, 2903 et l'apparition du culte d'Epona en Gaule au I siècle de notre ère. Hommages à Lucien Lerat. W. H. Paris, Les Belles Lettres: 131-134. Goudineau, C. and C. Peyre (1993). Bibracte et les Eduens: à la découverte d'un peuple gaulois. Paris Glux-en-Glenne, Editions Errance; Centre archéologique européen du Mont-Beuvray. Keppie, Lawrence (1998) Roman Inscribed and Sculptured Stones in the Hunterian Museum, University of Glasgow, Britannia Monograph Series No. 13, Society for the Promotion of Roman Studies. Calalogue number 36. Magnen, René; Thévenot , Emile (1953) Épona : déesse Gauloise des chevaux, protectrice des cavaliers.. Delmas, Bordeaux.